This is the official soundtrack for FRAMED Collection, featuring original live jazz performances that fuse modern themes and funky beats to create an evocative, mystery-laden groove. 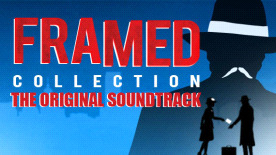 The soundtrack includes the music from both FRAMED and FRAMED 2. FRAMED 2 Original Soundtrack credits & legal info. Produced, Arranged & Composed by Adrian Moore. Saxophone Performed by Lauren Mullarvey. Mastered by Justin Shturtz, Sterling Sound NYC. Special thanks to Claire Barilla, Joshua Boggs, Ollie Browne, Stu Lloyd & Suzie Szabo. All music, images and products are licensed through Loveshack Entertainment. All music © Adrian Moore 2018. All rights reserved. For more information about the game, FRAMED Collection, please visit the store page. Please note: This content requires the base game FRAMED Collection in order to play.